Wow. Such a powerful and beautiful post. I nursed my son until he stopped feeling sad about it (mostly). It sounds like you're on such a similar path! 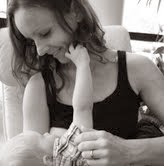 I love when I find out that online friends of mine and I are on a similar path...here, we did Baby Led Weaning (not sure if you'v heard of it and it almost doesn't matter whether you have, at this point as you're doing it)...My son is now four and hasn't nursed in more than 2 years. For a while, when I got out of the shower he would say that he wanted it. Now? He's fine with not. I nursed my last son until he was over 2 years old, too. My others self-weened, but he had no intentions of stopping. I loved it, and I knew he was my last, so I held on, too. Finally one day, I just had to tell him we were done. Now instead of nursing, we cuddle and read in his rocking chair, and it's still very sweet.